Cheshire - Brookfield has developed a pretty good flair for the dramatic. Bobby Drysdale scored on a 5-yard run on fourth-and-inches with 1 minute, 8 seconds left and ran in the 2-point conversion as the fifth-seeded Bobcats rallied to beat top-seeded Valley Regional/Old Lyme, 20-13, in a CIAC Class M playoff semifinal game at Cheshire High School. Drysdale's run gave Brookfield (11-3) its first and only lead. He ran 15 times for 88 yards. Drysdale also ran for a game-winning 4-yard touchdown with 38 seconds left in Tuesday's 22-21 quarterfinal win over Thanksgiving Day rival Bethel. "It's the fifth game that we played against a state-qualifying team, and (the Warriors) were an outstanding team," Brookfield coach Rich Angarano said. "And I mean that sincerely. We had to do everything we could to come up with this win. We ran the ball hard. They ran the ball hard. Their defense played well. Our defense played well." 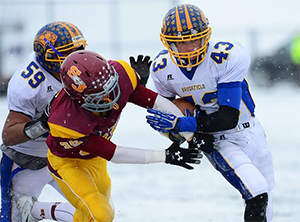 The Bobcats will play second-seeded St. Joseph for the state title either Friday or Saturday at Central Connecticut's Arute Field. St. Joseph beat No. 3 Barlow, 62-34. Valley Regional/Old Lyme finished 12-1. "It was an incredible season," Warriors coach Tim King said. "As I told the kids, losing is one thing, but I had to say goodbye to them. Saying goodbye to the seniors is very tough." Brookfield's Nick Seis sacked Phil Cohen on fourth-and-17 to give his team the ball at its own 48-yard line with over 4 minutes left in the game. Drysdale ran 37 yards on fourth-and-7 down to the Warriors' 15. Brad Westmark was about to be sacked when he threw an 11-yard pass to Austin Reich to set up fourth-and-goal at the Valley Regional/Old Lyme 5. Drysdale scored on the next play. Tyler Jaynes ran for a 13-yard touchdown to give the Warriors a 6-0 lead with over five minutes left in the second quarter. The extra point failed. The Bobcats' Gabe Pompette caught a 35-yard touchdown from Westmark to tie the game with 43 seconds left in the third quarter. The extra point was blocked. Cohen threw a 20-yard touchdown to Chris Jean-Pierre to give Valley Regional/Old Lyme the lead again. Jared Roche's extra point gave the Warriors a 13-6 lead with 10:50 left in the game. Brookfield's Daniel Jackson scored on a 9-yard run with over six minutes left. The conversion run failed as the Warriors held on to a 13-12 lead. David Peck caught what looked to be a 23-yard touchdown from Cohen on fourth-and-4 on Valley Regional/Old Lyme's next drive, but the play was wiped out by a holding call. RUSHING-Brookfield, Bobby Drysdale 15-88, Danny Jackson 13-69, Austin Reich 11-47, Brad Westmark 6-24. Valley Regional/Old Lyme, Tyler Jaynes 8-58, Chris Jean-Pierre 7-55, Phil Cohen 9-33, Evan Smith 1-1. PASSING-Brookfield, Brad Westmark 4-10-76. Valley Regional/Old Lyme, Phil Cohen 10-18-103-2. RECEIVING-Brookfield, Gabe Pompette 2-46, Nick Seis 1-19, Austin Reich 1-11. Valley Regional/Old Lyme, Chris Jean-Pierre 6-45, Evan Smith 3-47, David Peck 1-11. STRATFORD - St. Joseph faced some early adversity but Shane Miller helped the Cadets overcome it and advance to a state title game. Miller scored four touchdowns and second seeded St. Joseph never relinquished an early lead in a 62-34 victory over third seeded Joel Barlow in a CIAC Class M semifinal matchup Saturday afternoon at Bunnell High School. With the win the Cadets advance to the Class M State Championship game where they will face fifth-seeded Brookfield, which advanced with a 20-13 victory over No. 1 Valley Regional in Saturday's other Class M semifinal. Miller ran for three touchdowns and caught a TD pass to more than make up for the loss of star running back Mufasha Abdul Basir, who suffered a scary injury in he first 42 seconds of the game and was taken from the field in an ambulance. Basir returned to the St. Joseph sideline late in the game and is expected to play in the Class M title game after suffering a stinger. In Basir's absence, Miller made the Cadets offense go. "Mufasha is a great player and works so hard, but we knew with him out we needed to step up and make plays," Miller said. "Coach called my number a few times today and I was able to take advantage and make some plays for us." Miller scored two touchdowns in the first half as St. Joseph raced out to a 28-0 lead at the break. He ran for a 52-yard score in the first quarter and caught a 28-yard scoring strike from Jordan Vazzano in the second quarter. While the Cadets were clicking on offense in the first half the Falcons were struggling to get their triple option offense on track. Two Joel Barlow possessions ended on downs in St. Joseph territory in the first quarter and another was halted on a fumble. "Their offense is very difficult to prepare for and to put up a zero in the first half was just a tremendous job by our defense," St. Joseph coach Joe DellaVecchia said. The Falcons didn't go quietly and started to get back into the game in the third quarter when they outscored the Cadets, 20-6. Barlow quarterback Jack Shaban and the option game got going and the Falcons got TD runs by Bryan Gallaer and Harry Wilson and an electrifying 75-yard kickoff return by Shaban to pull within 34-20 enters the fourth quarter. After Wilson scored on a 36-yard run, the Falcons recovered an onside kick and were on the move again. The drive went into the fourth quarter with Barlow facing a 4th-and-5 at the St. Joseph 9. Shaban gained four when he needed five and the ensuing drive by he Cadets essentially ended any hopes of a comeback for the Falcons. Miller ripped off 35 yards on a first down run and three plays later he scored from 22-yards out to extend the Cadets lead to 42-20 with 10:22 to play. "Shane Miller has been tremendous for us all season," DellaVecchia said. "He just has that extra gear and made some huge plays for us today." Barlow (10-3) never quit but ultimately couldn't overcome the big first-half deficit. It was a tough end to the season for the Falcons but it will still go down as the best season in program history with rthis being the first Joel Barlow football team to advance to the state playoffs. "We made some adjustments at the half as far as our blocking goes and we were able to move the ball in the second half," Joel Barlow coach Rob Tynan said. "We had a tremendous season and this group of seniors has laid the foundation and established the program, shown everyone what we want to be. We just lost to a better football team today." RUSHING - St. Joseph, Mufasha Abdul Basir 3-35, Shane Miller 8-188, Joey Civitella 10-86, Jordan Vazzano 5-77. Joel Barlow, Jack Shaban 19-135, Stephen Miller 7-123, Bryan Gallaer 8-66, Harry Wilson 6-77. PASSING - St. Joseph, 9-15-110. Joel Barlow, Jack Shaban 0-5-2-0. RECEIVING - St. Joseph, Lars Pederson 5-63, Mark Hirschbeck 2-8, Shane Miller 2-39. Joel Barlow, none. NEW BRITAIN - For the third time in the last five seasons the St. Joseph Cadets are State Championship rolling over Brookfield easily 54-8. "It's a different group of kids, in 2011 we lost a lot of players and all these kids had to play as sophomores and we got beat up a bit," said St. Joseph's head coach Joe Dellavecchia. "To make the playoffs last year and get knocked out early, we had a little attitude coming into this year and we knew were better than that and wanted to finish it off." 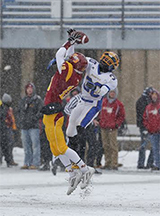 Musfasha Abdul Basir rushed for 166-yards and two touchdowns, all in the first half, leading the way for the Cadets in the snowy conditions. "More due to the field conditions when we got here, we thought we'd have to play more of an inside game," said Dellavecchia. St. Joseph's quarterback Jordan Vazzano started the game off throwing two incomplete passes. He then completed his last five passes, four of them for touchdowns. "We talked before game and said he was fine," said "He has a strong arm and big hands so he felt fine. He just wasn't putting heat on the first two passes." The Cadets were able to do what they wanted to against the Bobcats defense all game. "We got beat by a better team, they were as advertised," said Brookfield head coach, Rich Angarano. "Not much we could do as an offense and they ran the ball down our throats." With his third State title under his belt Dellavecchia doesn't have a favorite. "They're all special in there different way," said Dellavecchia. "First two with my sons and this one, we worked really hard the past three years to get back here, you never know when you're going to get an opportunity like this. It's a special feeling."